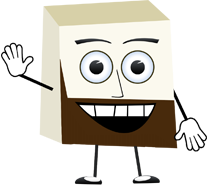 Hello Everyone – are you still there? Sorry again that the weekend has come and gone with no postings but I will make up for it with some extra ones this next few days. 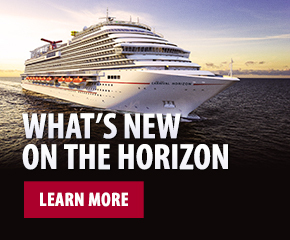 Heidi and I continued to prepare for the first Grand Med cruise by meeting with all the department heads and discussing schedules and various things to make sure it all goes smoothly. This resulted in there being no time to disembark the ship today. In fact, I have not been ashore since Naples so hopefully in Shivi ta veck ear (spelt phonetically) Heidi and I may have a brief moment to go for lunch or dinner. One of the biggest things we have to organize is the tender service in Cannes, France. Tendering anywhere is always a challenge and especially in a port like Cannes where everyone is ready to leave the ship at the same time. The Carnival Freedom arrives at 9 am and it takes us about two hours and 30 minutes to get everyone ashore. This involves a lot of planning from my side and a touch of patience from the guests, which most have but a very small percentage do not!! 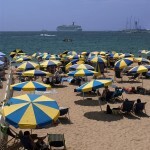 Talking of Cannes, here is a photo of the beach in front of the world famous Martinez Hotel with the ship on the horizon (Heidi took this one, if it was my photo I would have concentrated more on the people on the beach some of which have, for some strange reason, forgotten to put their bikinis on ). Can I also just quickly show you a personal photo of my Dad’s office at home? 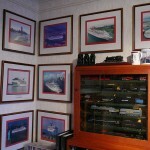 He is a big collector of photos from the various ships that I have started from new as well as steam locomotives and he has a special collection of decks of cards. I have no reason to post this blog except to show you how proud my Dad is of his collection and I guess having your own blog thingy has its privileges. Actually, if you zoom in on one of the photos you can see why the photo of the Carnival Destiny sailing out of New York in 1996 has a special place in the collection and in my heart. I had better get on with the Q and A which because the site has not been…ummmmmmmmm……….re shoed ( or is it booted ) or something may be shorter than usual because some of the posted comments are not stuck on the thing yet……….I am truly out of my depth here with this computer talk. RICH – Great idea about introducing the engineering team. I will be doing this within the next few days and posting some photos as well. You asked why a ship is called a SHE, here is why. A ship is called ‘she’ because there is always a great deal of ‘bustle’ around her. ; There is usually a gang of men about; She has a ‘waist’ and ‘stays’; It takes a lot of paint to keep her looking good; It is not the initial expense that ‘breaks’ you, it is the ‘upkeep’; She can be all ‘decked’ out; It takes an experienced man to handle ‘her’ correctly; And without a man at the helm, she is absolutely uncontrollable; She shows her ‘topsides’; Hides her ‘bottom’; And, when coming into port, ALWAYS HEADS FOR THE ‘BUOYS’. That is why a ship is called “SHE”……………………………….Heidi has just read this and is not happy ! You asked how much she cost – $500 million…..and she is stunning! From a distance she looks like Angelina Jolie. She has a huge pair of thrusters………………just ..OK, Heidi says I have to stop now. JAMIE IN TEXAS – The Cigar with John will be a nightly activity I promise and I will even bring the cigars. Hope that was the push you needed to book the cruise. See you soon…….I hope. 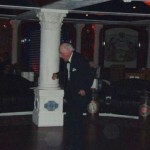 BIG ED – I am not sure which of my blogs will be up first after the weekend so let me make sure that I will not let you down and I will be the CD on the 26th when you cruise. I am so very sorry I could not make the bloggers cruise that week but circumstances took over. Regardless, I have a booth reserved for us on both cruises and we will have a BIG time together. As for the concerns, you have about getting a reply to logging on to the BLOGGERS CRUISE I have been advised that you check your JUNK E-MAIL BOX………..I guess I have been thrown in your trash. Please take me out…..it smells. Love to Mrs. BIG ED. FRED AND CHRIS – It will not be long before August is here and you are both exploring Europe with us. Please send a reminder to me a few days before you sail and I will pull those strings as best I can. Thank you for reading the blog thing from the beginning and maybe together we might even win an award. PATRICK TYE – Can you post your mailing address in Kuwait and I will pop a CD in the post to you. How are things over there, I would love to visit one day. Please keep reading the blog and write soon. SUSAN JORDAN – So your boyfriend has booked you a balcony cabin and three extra days in Rome. He sounds like a real stud muffin and all that’s missing Is a ring on your finger. What a shame you will not be sailing to any romantic cities, somewhere with lots of little boats that sail under gorgeous bridges and through enchanting canals while the man navigating the boat by pushing a big stick up and down sings Italian love arias to you both, giving your boyfriend a chance to kneel next to you and say ” Susan, I Love You Now and for Ever, Will You Marry Me.” What a shame …………..oh……….wait a minute……………we do go to such a place…………………….VENICE………………………..no pressure then! Looking forward to seeing you. GARY – There are many restaurants in Rome which are simply awesome. Bars and cafés spill out into the streets as Al Fresco eating remains very popular. Most Romans do not eat dinner before 8 pm with most eating around 9 – 9:30 pm. Anyway, let me know where you end up and we can post any recommendations on the blog thingy. Last night I introduced a special man on to the small stage in our Habana Bar. I had been talking to him since the start of the cruise and he became one of the characters of the week. This wonderful man was an old Vaudevillian performer who had danced in movies and shows all over the world. He proudly told me he had four lines in the movie HOLIDAY INN with Fred Astaire and also featured as a featured tap dancer in the movie The Band Wagon. Hearing this, I asked him if he would like to dance for us and he said he would love to with the Gavin Ahearn Jazz Trio. So, last night he danced for us to MR BO JANGLES, his feet glided across the floor and as the audience applauded and cheered a smile as big as the ship itself spread across his face. Just for a minute, I think he was back on the film set dancing with Mr. Astaire himself. I should have brought a camera but I quickly grabbed a cell phone and used it to take this photo which does not do him justice………………..but anyway, here is the one and only Sidney Neller (age 94) treading the boards one more time.